Beckoning Point Geophysical Surveys | Sea Engineering, Inc. The U.S. Navy is planning to construct a new Magnetic Silencing Facility at Beckoning Point, Pearl Harbor, Oahu. The project will include construction of a new 700-foot long non-magnetic concrete pier. A major factor in the preparation of the preliminary cost estimates was the bearing capacity of the offshore sediments and that impact on bearing pile length. 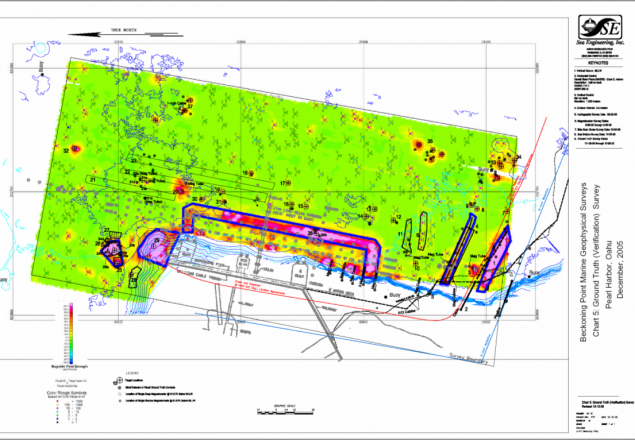 SEI conducted detailed marine geophysical surveys so that geotechnical engineers could optimize the location of twenty-one planned boring sites. Surveys included multibeam bathymetry, side scan and sub-bottom surveys, and an unexploded ordnance (UXO) survey. The UXO survey was conducted with a towed cesium vapor magnetometer. Contour plots of the anomalies were produced and UXO Analysis System software was used to screen for UXO. Diving investigations were then conducted to verify the results of the UXO survey.